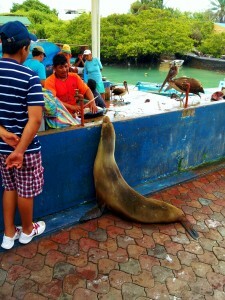 The final island we visited was Santa Cruz, the most developed and touristy island of the Galapagos. The main town, Puerto Ayroa, has plenty of hotels, restaurants, and souvenir shops and is where the Galapagos cruises depart. Additionally, there are several travel agents to book tours around the Galapagos, but we found the island fairly easy to manage independently. The main road in town runs parallel to the shore and leads to two major attractions: the Charles Darwin Station and the fish market. The Charles Darwin Station is a research center that has exhibits on some of the endemic animals and plants and the conservation effort on the islands. The exhibits are spread out along a nice walking path, which allowed us to see more of the famed giant Galapagos turtles and the land iguanas, which we had not seen yet. This was one of the few places we saw caged animals in the islands. Afterward, we visited the fish market, which is actually just a few tables set up by the beach. The fishermen would bring up the catch and the vendors would clean the fish on site. The sea lions and seagulls would come up from the water and wait for the leftovers, a stark contrast to the caged animals at the Charles Darwin Station. Seeing the animals sneak around and try to steal the fish was one of the highlights of the island and entertained us for quite a while. The next day, we ventured out to Tortuga Bay, renown for the white beaches and clear water. The hike to beach would typically be considered fairly easy at about 2 miles. However, the heat and humidity make the walk seem much longer. We required several water breaks along the way. It is well worth it and upon arrival, we both agreed it is the most beautiful beach we have ever seen. The beach was nice for swimming and for spotting land iguanas. The highlight was the Red Mangrove, a shallow inlet dividing the beach, where white tip reef sharks swam through our legs. One of the most unique sites we visited was Las Greitas, a calm, clear swimming areas between two steep lava cliffs. 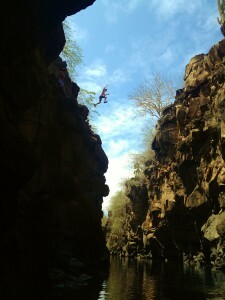 The swimming area is fairly deep and narrow and the cliffs are very high, around 50 ft, which makes it perfect for cliff diving. Kyle and I are not confident in our diving ability so we left the jumping up to other people, but it was still a rush to watch people jump. It was also a great place to meet other tourists and swap Galapagos stories since everyone hung out on a few rocks after swimming. Due to the heat and our travel fatigue, we required quite a bit of down time in the Galapagos. With that in mind, we booked our hotel, Hotel Ninfa, solely due to the fact it had a pool. After fighting ocean current at the beach, we enjoyed taking a dip in the pool. Usually in the United States, pool rules are pretty strict: no glass, no running, no guests. Luckily for us, they were much more lax in Ecuador and we were able to have a “Galapa-vegas” afternoon pool party with our new friends, complete with glass beer bottles. We thought that would conclude our Galapagos adventure, but unknowingly, we had one more in store: getting to the airport. The Baltra airport is actually located on a smaller island north of Santa Cruz, but serves most of the Galapagos. In order to reach the airport, first, we had to take a taxi to a bus from Puerto Ayora, the main town, to a ferry. Unfortunately, the last bus left at 8:30am so even though our flight was not until 1pm, we were stuck going early. Once we reached the port, we had to load our luggage on the ferry for a 5 min ride across a small canal. Then we waited for airport shuttle, loaded our bags again. After a 10 minute ride, we finally reached the airport… about 3 hours early. This officially concluding our Galapagos adventure.